Bob Peel was born in 1939 in Memphis, Tennessee. He enlisted in the Aviation Cadet Program of the U.S. Air Force on January 25, 1960, attended Pre-Flight Training at Lackland AFB, Texas, from January to April 1960, and was commissioned a 2d Lt and awarded his pilot wings at Vance AFB, Oklahoma, on May 12, 1961. Lt Peel next completed F-102 Delta Dagger Combat Crew Training with the 3555th Flying Training Wing at Perrin AFB, Texas, in November 1961, followed by service as an F-102 pilot with the 509th Fighter Interceptor Squadron at Clark AB in the Philippines from January 1962 to April 1964. His next assignment was to F-105 Thunderchief Combat Crew Training from May to September 1964, and then as an F-105 pilot with the 335th Tactical Fighter Squadron at Seymour Johnson AFB, North Carolina, from November 1964 to April 1965. During this time he deployed with his unit to Incirlik AB, Turkey, from November 1964 to February 1965. Lt Peel served as an F-105 pilot with the 333rd Tactical Fighter Squadron at Seymour Johnson AFB from May 1, 1965, until he was forced to eject over North Vietnam while on temporary duty to Southeast Asia on May 31, 1965. After spending 2,815 days in captivity, Maj Peel was released during Operation Homecoming on February 12, 1973. He was briefly hospitalized to recover from his injuries at Scott AFB, Illinois, and then attended Pilot Requalification Training and A-7 Corsair II Combat Crew Training. 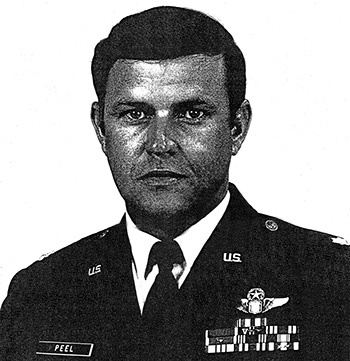 Maj Peel received an Air Force Institute of Technology assignment to complete his bachelor's degree from November 1974 to June 1975, and then attended Air Command and Staff College at Maxwell AFB, Alabama, from June 1975 to June 1976. His next assignment was as an A-7 and then A-10 Thunderbolt II pilot with the 355th Tactical Fighter Wing at Davis-Monthan AFB, Arizona, from June 1976 until his retirement from the Air Force on February 1, 1980. 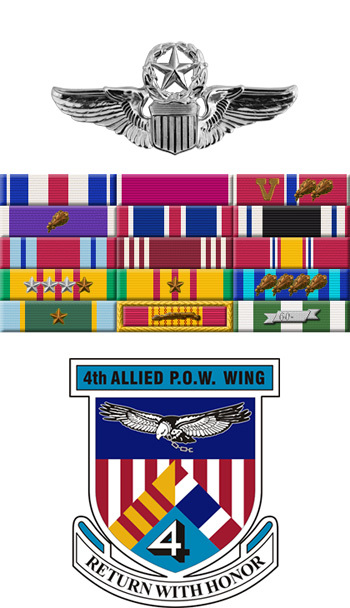 On 6 June 1966: This officer distinguished himself by gallantry and intrepidity in action in connection with military operations against an opposing armed force while a Prisoner of War in North Vietnam. Ignoring international agreements on treatment of prisoners of war, the enemy resorted to mental and physical cruelties to obtain information, confessions and propaganda materials. This American resisted their demands by calling upon his deepest inner strengths in a manner which reflected his devotion to duty and great credit upon himself and the United States Air Force.